(Bloomberg) -- Bank Indonesia’s intervention should stabilize its financial markets, so lower bond yields -- even a rate cut -- are still a possibility later this year, according to analysts. 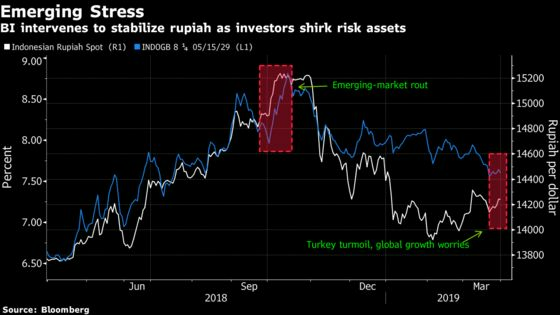 The central bank has been buying local bonds and selling dollars to help prop up the rupiah -- one of the most sensitive currencies in Asia to risk sentiment -- as investors sold high-beta assets on global growth jitters and turmoil in Turkey. While Indonesian assets are once again under pressure, any financial pain is seen as short-lived. Fears of a U.S. recession and Turkey’s funding crisis have dulled the appeal of risk assets, leading to an erosion of gains in emerging markets. BI Governor Perry Warjiyo has sought to distance the nation from the turbulence in Turkey and pledged last Thursday to intervene during a sell-off. The bank has repeatedly injected liquidity into markets through currency swaps and repo auctions, in addition to buying bonds, to safeguard the currency. The rupiah slipped 1.2 percent in March against the dollar. Investors had been warming to Indonesian securities since the start of the year, helped by a dovish pivot from global central banks and optimism over a U.S.-China trade resolution. Overseas investors bought nearly $5 billion of Indonesian bonds in the first three months of 2019, the largest quarterly inflow based on data compiled by Bloomberg starting in 2009. While the median analyst forecast is for the policy rate to stay unchanged this year, some market participants including Mizuho, PT Mirae Asset Sekuritas and TD Securities say a cut is possible, and overall expectations for bond yields are falling. The median end-of-year estimate for Indonesia’s 10-year yield has slipped to 7.90 percent from 8.15 percent in November, according to the latest Bloomberg survey. The benchmark fell 2 basis points to 7.61 percent on Monday, adding to the 18 basis points decline in March. The most recent intervention “aims to help restore confidence in anticipation of profit-taking activities by foreign investors,” said Jennifer Kusuma, senior Asia rates strategist at Australia & New Zealand Banking Group Ltd. in Singapore.